What Does Comprehensive Coverage for Auto Insurance? Want a flexible car insurance coverage that provides a lot of value without the high cost? The first level of coverage beyond the state minimum coverage is comprehensive coverage. Comprehensive is great because it protects against so many different types of physical damage to your vehicle. Comprehensive coverage goes by a few different names and can be used as a stand-alone coverage for your vehicle or in combination with other coverage. For the average driver, comprehensive is usually a fairly affordable coverage. It obviously varies per vehicle and per driver but overall for what you get, it is usually worth the cost. Even a windshield replacement can cost several hundred dollars and cracked windshields are not uncommon. Contact your insurance agent to help you review the benefits of comprehensive coverage. It could potentially save you thousands of dollars of out of pocket car expenses. When Can You Add Coverage? Comprehensive is also used as a way to protect your vehicle while it is in storage. If you are not driving your vehicle for an extended period of time, you might be interested to know, comprehensive coverage provides protection for physical damage while it is parked. So if anything happens to the vehicle while it is not being driven, comprehensive coverage will cover the costs of repairs minus your deductible. You can save a lot of money by taking liability coverage off the vehicle and having comprehensive coverage only. Will My Home Insurance Cover My Car? It is a misconception that home insurance will cover a car parked in the garage. A fire or home collapsing on the vehicle will not be covered by a home insurance policy. The only place to find coverage is on an auto policy. Some insurance carriers might let you add an endorsement to your home owner's policy if the vehicle is an antique. Definitely, verify with your insurance agent what coverage is offered by a home insurance policy. Both chipped windshields and cracked windshields are covered under comprehensive coverage. The cause of the damage will not affect coverage. Any glass damage, including door glass, back glass, and sunroofs all fall within comprehensive coverage. One of the most common comprehensive claims is a deer accident. Comprehensive coverage will actually extend to any animal including but not limited to birds, raccoons, and dogs. Hail can strike without much notice and you can’t always be parked in your garage. With comprehensive coverage, you will be protected from all those hail nicks. Fire can do extreme damage to a vehicle. Whether the fire was engine related or started by your crazy ex-girlfriend, comprehensive will cover your vehicle. If your vehicle has been missing for more than 30 days, comprehensive will pay the actual cash value of your missing vehicle minus the deductible. Any kind of vandalism to your vehicle including your car being keyed or paint being eaten away by the neighborhood kids egging your vehicle is covered under comp. If the water table rises to ridiculous heights, comprehensive coverage will get your vehicle dried out. 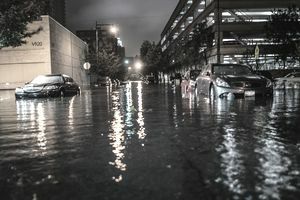 It does not matter what caused the flood whether it is a hurricane, dam break, or torrential rainfall severe water damage is covered by comprehensive. If you find your vehicle smashed under a tree, the only way your insurance company will pay for repairs is if you purchased comprehensive coverage. Select your deductible at the time you purchase comprehensive coverage. Some insurance carriers do offer a zero deductible on comprehensive, but you pay a higher price. If you do select a deductible, you will have to pay the deductible at the time of loss. It doesn’t matter if it was an act of God; deductibles apply if you select a deductible. Will a Claim Affect My Car Insurance Rate? More and more insurance carriers are surcharging for comprehensive claims. Some still do not charge unless you file three or more comprehensive claims in three years. Most do not surcharge for a windshield but hitting multiple deer in a short period of time can have a negative impact. Insurance carriers keep a very close eye on claims. If you file one claim, they determine you are more likely to file another. Think about it. If you are driving through a cornfield on the way to work every day, you are bound to see deer and unfortunately more likely to hit them. If you had zero claims, would you be happy knowing your neighbor who hit a deer or two is paying the same rate as you? It is hard to justify the reasons insurance carriers rate the way they do. If you are worried about rate increases due to comprehensive claims, make sure to ask your car insurance agent how your carrier handles them. Shop around with different carriers and make claims a priority in your questioning.